News just in from Wes Sanford at Northrop & Johnson and Thierry Voisin that they've signed a joint listing for sale of the 61.3m expedition yacht Voyager. Built in 1973 by Astilleros y Talleres Celaya and most recently refitted in 2012, Voyager sleeps 12 guests in eight staterooms and is helicopter capable. 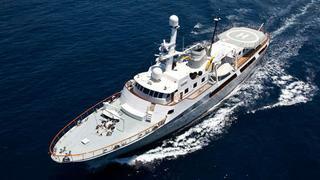 Twin 1,125 Caterpillar engines give her a range of 4,800 nautical miles. Lying in Loano, Italy, Voyager is asking €7.4 million.